Read What Others Are Saying About This Guide! “I just wish we had been exposed to this kind of education about SML before we made our purchase!” - Robert Harbert Smith Mountain Lake has quickly become one of the East’s most popular destinations for vacationers, second-homeowners, retirees, and telecommuters. The lake is a natural draw for water and mountain lovers of all sorts. Yet this rush to buy lots and homes here has meant problems for some. Smith Mountain Lake, like all waterfront destinations, has a number of issues that, if ignored, can have serious repercussions for property values and quality of life. Fortunately, each of these issues can be navigated successfully with good counsel and careful investigation. That is the purpose of this book. 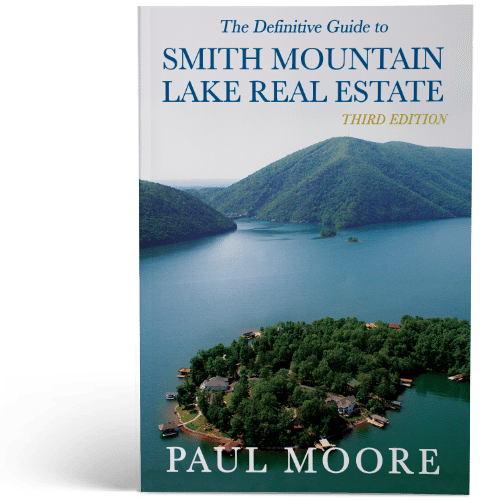 If you own or are considering buying property at Smith Mountain Lake, this comprehensive book is a must! You may purchase the Definitive Guide to Smith Mountain Lake Real Estate Book on Amazon where it sells for $24.99 (See Order Button on left). WANT THE BOOK FOR HALF PRICE? Simply Fill Out the Form Below completely and we will send you the book for $12.49. One of our Agents will follow up to assist in your SML property search. There’s not a better combination to assure you find your dream home here at Smith Mountain Lake! *ONE OF OUR AGENTS WILL CONTACT YOU TO SEE HOW WE CAN ASSIST YOU FURTHER, WHEN YOU FILL OUT THIS FORM TO GET THE BOOK FOR $12.49! Prefer to read books online? Download the E-Book version for FREE! Simply fill out the form below, and an email will be sent to you containing the PDF download link. (Adobe Reader or an equivalent PDF reader is required). (The download link will be sent to your email address).